Drones are becoming more and more popular. We look at how they can be used within the snowsports industry. Last month Iain from Skipedia presented at LISTEX about some of the new technologies available and looked at their applications. This is a reprise of that presentation, covering some the key points. Within the UK sales of drones continue to increase significantly. Christmas 2015 saw a 24% rise in drone sales and a similar increase is expected this year with new products hitting the market regularly. The most famous news story about drones to date is that Amazon have started running tests to explore the viability of drones carrying deliveries in the UK. The Daily Telegraph recently ran a story on the (relatively) ‘secret’ testing taking place right now in Suffolk. 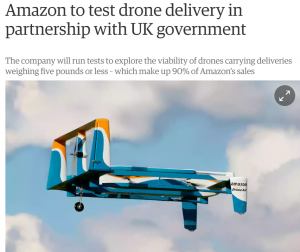 While there is the suspicion that Amazon are more interested in the PR from this story, than its actual application, the company claim that drones could be used to carry deliveries weighing five pounds or less – a range that covers 90% of Amazon’s sales. Other news stories relating to drones you may have come across typically relate to safety and the potential dangers of drone use. There have been several stories about near misses with planes, and fears of use by terrorists remain a concern. 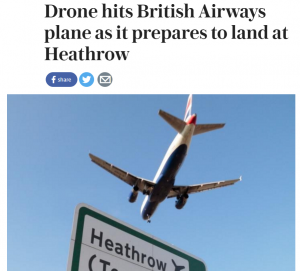 Under UK law, drones are currently classified as ‘unmanned aircraft’. This means that for non-commercial use you are restricted to areas at least 150m from ‘congested areas’ and at least 50m from ‘a person, vessel, vehicle or structure’. It has to be kept within sight at all times and cannot be flown above 400ft in altitude or further than 500m from you. This applies to drones that weight under 20kg (which includes most of them). For commercial use (i.e. you’re ‘receiving payment’) you must have permission from the CAA. This requires that you show you are ‘sufficiently competent’. This vague term does not require you to obtain a licence, but this is recommended. For all the concerns, there are some very exciting products out there, with new products being brought onto the market every month. Our favourite of the options on the market right now is the Lily. Drone technology is still nascent and while the specs are improving the whole time, probably the single biggest limiter right now is battery life. Most drones can only stay in the air for 15-20 minutes, depending on use. We’ve noted above the delays in bringing products to market and this is in part related to how quickly technology is moving forward. A 2K camera that was top quality only a year ago now seems hopelessly out of date, with 4K the new standard. Add to that improvements in Bluetooth and WiFi connectivity, as well as obstacle detection and the challenges to producers are evident. 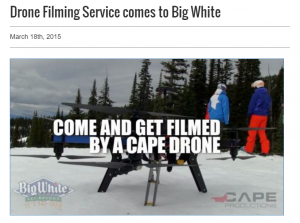 Can you use drones in ski resorts? In Europe the issue is less clear. Many resorts (see Courchevel’s response below) will simply refer you on to the local authorities. Drones may technically not be allowed, but they can often be seen in resort. One resident of the Tarentaise we spoke to confirmed that the local gendarmes had asked him about his drone, having seen it in his window, but were more concerned that he had insurance than anything else. Certainly continued terrorist activity may well lead to a blanket ban in due course, but currently use is possible. Some ski resorts have seen that opportunity that drones present in terms of bringing a new service to their guests. Both Big White and Verbier are offering a commercial use where guests can have themselves filmed down a set route and are then supplied with an edited version to share and use later. 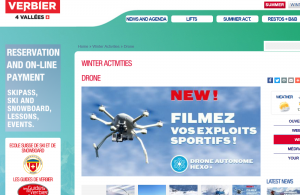 So the trend looks to continue that personal use of drones in ski resorts will become more limited, while (in Europe) at least, it is still currently possible. Other uses include filming race training and ski lessons for businesses in resort, as well as lift inspections and avalanche blasting by lift companies. No doubt there will be more commercial applications in due course, but in the meantime if you want to do any filming yourself, you may need a licence or simply to get away from the crowds!